Cosmetic or dermatological compositions that contain an effective amount of one or several dissolved or suspended oligomers, and/or polymers, and/or co-oligomers and/or co-polymers of one or several α-hydroxycarboxylic acids having the general formula (I) and linked to each other according to the scheme (II) are useful to administer the monomer α-hydroxycarboxylic acids upon which they are based in cosmetic or dermatological compositions. The present invention relates to preparations in the field of cosmetic and dermatological skin and hair care, particularly those preparations with a low potential for irritation or cosmetic or dermatological preparations for the prophylaxis, Lin¬ alteration, removal or prevention of skin irritation. In a preferred Ausfüh¬ approximate shape, the present invention relates to cosmetic and dermatological Zube¬ TION for the prophylaxis and treatment of cosmetic or dermatological Hautverän¬ changes such as aging of the skin. Furthermore, the present invention relates Zuberei obligations against the appearance of dry or rough skin. The present invention further relates to active ingredients and formulations comprising such Wirk¬ materials containing, for cosmetic and dermatological treatment or prophylaxis of erythematous, inflammatory, allergic or autoimmune-reactive symptoms, more particularly sondere dermatoses. Further, the invention provides the use of such agents and formulations relates to, such active ingredients, for immune stimulation of the skin, thereby vor¬ geous also for immune stimulation in terms of treatment of the injured skin, ins¬ particular for the treatment of wounds. Finally, the invention preparations with extremely low so-called concerns "Stin- went potential." Under skin care means primarily that the natural function of the skin is strengthened as a barrier against environmental influences (eg dirt, chemicals, microorganisms) and against the loss of endogenous substances (eg water, natural fats, electrolytes). If this function is impaired, increased resorption of toxic or allergenic substances or attack by microorganisms, leading to toxic or allergic skin reactions. Another aim of skin care is, the fat and Was¬ caused by daily washing server loss of skin compensate. This is particularly important if the natural regeneration ability is inadequate. Furthermore, skin care products against environmental influences, in particular against sun and wind, and delay the signs of aging. Medicinal topical compositions comprise one or more control Me¬ dikamente in an effective concentration. For simplicity, connection between cosmetic and medicinal use and corresponding products is to clean Unterschei¬ to the legal provisions of the Federal Republic of Germany (eg Cosmetics Directive, Foods and Drugs Act). The epidermis is rich bodies with nerves and nerve as Pacinian slat, Merkel cell neurite complexes and free nerve endings for pain, cold, heat and itching. In people with sensitive or easily injured skin, one with "stinging" may (<engl.> = Hurt "to sting", burn, hurt) neurosensory phenomenon observed. This "sensitive skin" differs fundamentally from "dry skin" with thickened and hardened horny layers. Typical reactions of "stinging" sensitive skin are redness, tightening and burning of the skin and itching. As a neurosensory phenomenon the itching is to be considered in atopic skin and itching associated with skin diseases. "Stinging' phenomena can be viewed as cosmetically disorders to be treated wer¬ to. Severe itching on the other hand, especially in atopy occurring severe itching may also be called a serious dermatological disorder. Typical, with the terms" stinging "or" sensitive skin "in connection brought troublesome neurosensory phenomena are skin redness, tingling, prickling, tightening and burning of the skin and itching. you can stimulating environmental conditions, eg massage, Tensideinwirkung, weather influence such as sun, cold, dryness, but also moist heat, radiant heat and UV radiation, for example, the sun caused. In "Journal of the Society of Cosmetic Chemists" 28, p.197 - 209 (May 1977) and PJFrosch AMKligman describe a method for estimating the "stinging potential" of topically administered substances. As positive substances such as lactic acid and pyruvic acid are used here. According to present knowledge, such a sensitivity to very particularly voted substances occurs between individuals. This means a person who is experienced in contact with a substance, such as lactic acid "stinging effects" will experience repeated with high probability in all communications. Contact with other "Stingem" but can also run without any reaction even in the same person. The cosmetic and dermatological use of α-hydroxy carboxylic acids is known per se. For example, citric acid is used for buffering cosmetic and / or dermato¬ logical preparations, but also as a synergist for antioxidants in skin and hair cosmetics. DE-OS 42 04 321 describes the use of longer-chain α-hydroxycarboxylic acids as active ingredients for cosmetic deodorants. U.S. Patent No. 4,363,815 describes the extension of α-hydroxycarboxylic acids Verwen¬ for the treatment of inflammatory skin manifestations. US patent 4,380,549 describes the use of α-hydroxy carboxylic acids to relieve the symptoms of dry skin. Even more topical applications of the α- hydroxy carboxylic acids are known, but these few examples show already that the α- hydroxy carboxylic acids are valuable skin active substances now classification being cosmetic or pharmaceutical use. It lacked the art, however, acids of dosage forms for α-Hydroxycar¬. It was therefore an object of the present invention to enrich the prior "art in this regard and to develop new forms of α-hydroxy carboxylic acids. One of wertere task to develop such dosage forms in which the α-hydroxy carboxylic acids not with other substances of cosmetic or dermatological formulations in which they are present incorporated, interact, but their effect only on the skin. However, it is disadvantageous that the safe use amount of the α-hydroxycarboxylic acids may be limited in the individual case, as can occur at concentrations below 0.5 wt .-%, the previously described "stinging" in sensitive individuals. But since it is desirable to allow the cosmetic or der¬ matologische administration of α-hydroxycarboxylic acids also susceptible individuals, it was an object of the present invention to develop cosmetic or dermatological preparations, which do contain α-hydroxycarboxylic acids or release, however, by featuring an extremely low "stinging potential" should be substantially free from "Stingingeffekten" at best. Erythematous skin symptoms also occur as concomitant symptoms with certain Haut¬ complaints or irregularities on. For example, the typical skin rash in the symptoms of acne is regularly more or less reddened. An object was therefore to remedy the disadvantages of the prior art. Insbeson particular object of the present invention, cosmetic or dermatological Zube¬ TION to make available, in which the advantageous properties of α-hydroxycarboxylic acids can be used a part without, however, the disadvantage of possible incompatibilities, such as the stinging would occur. Furthermore, for the cosmetic and dermatological Be¬ treatment and / or prophylaxis should such active ingredients active substances and preparations are erythematous, inflammatory, allergic or autoimmune-reactive symptoms provided, in particular dermatoses. Polymers of many α-hydroxycarboxylic acids, wherein the linkage of the monomers takes place unterein¬ other through ester bond of the α-hydroxy groups with the carboxyl groups are known per se. Mainly those based on lactic acid and / or glycolic acid, are used in surgery as absorbable suture or implant material. They are also used in cosmetics, but there exclusively as a cladding material. Their disadvantage is that they are not or insufficiently soluble in most cosmetic and pharmaceutically acceptable solvents, and therefore a different cosmetic or pharmaceutical use as a shell material had to be excluded so far. A further object of the present invention to remedy this deficiency. (a7) with one or more carboxyl groups and / or hydroxyl groups and / or Oxo¬ groups (keto groups) and / or branched and / or unbranched C | forming _25- alkyl-substituted cycloalkyl group having 3 to 7 ring atoms, wherein the number n is at least 40 wt .-% of the oligomers or used and / or polymers and / or co-oligomers and / or copolymers is at least 4, and wherein R 'and R "of the individual α-hydroxycarboxylic acid within a co-oligomer or co-polymer to R' or R" of one or more α-th Hydroxycarbonsäureeinhei¬ thereof co-oligomer or co-polymer identical or different may be in dissolved or suspended form, the disadvantages of the prior art remedy schaf¬ fen. (A7) with one or more carboxyl groups and / or hydroxyl groups and / or Oxo¬ groups (keto groups) and / or branched and / or unbranched forms C1.25- alkyl substituted cycloalkyl group having 3 to 7 ring atoms, wherein the number n is at least 40 wt .-% of the oligomers or used and / or polymers and / or co-oligomers co-polymers is and / or at least 4, and wherein R 'and R "of the individual α-hydroxycarboxylic acid within a co-olive Gomer or Co-polymer to R 'or R "of one or more α-th Hydroxycarbonsäureeinhei¬ thereof co-oligomer or co-polymer may be the same or different, for administration of the underlying monomeric α-hydroxycarboxylic acids in kosmeti¬ rule or dermatological preparations. It was especially not foresee that the Verwen¬ invention-making not only the α-hydroxy carboxylic acids are practically reduced even for sensitive people to zero "stinging potential", but that in addition, would retain the full activity of α-hydroxy carboxylic acids. Furthermore was surprising that the present invention opens the possibility of producing stable and reliable the drug-releasing forms of α-hydroxy carboxylic acids. While it was known polymers or copolymers of lactic acid and / or glycolic acid in cosmetics, namely to use as a cover material for drug-containing microcapsules. Thus be¬ EP-OS 447 318 writes compositions for cosmetic or care pharmazeu¬ diagram of the upper skin layers, which polymers in a suitable carrier, bio¬ logically degradable nanoparticles contain which surround an oily active substance. Among the polymeric shell materials described supra also the poly (L) lactic acid, the poly (DL) lactic acid, poly-glycolic acid, and copolymers of lactic and glycolic acid find. An indication which would have in the direction of the present invention may include, but is not found in those letters. It was particularly surprising that cosmetic or dermatological preparations according to the invention, particularly when the inventive oligomers, polymers, co-oligomers and / or co-polymers are incorporated into an oil phase against depolymerization (or Deoligomerisation) are stable and their beneficial have effect only on human skin. Since the inventive oligomers, polymers, co-oligomers, and / or co-polymers gradually release the underlying monomers them suitable in an excellent manner as depot systems or for sustained release. The inventive oligomers, polymers, co-oligomers and / or copolymers also have surprisingly advantage, even if their hydrolysis is not yet or not yet fully done to the parent monomers to increase skin moisture. (a6) unsubstituted cycloalkyl group having 3 to 7 ring atoms or a (a7) with one or more carboxyl groups and / or hydroxyl groups and / or oxo groups (keto groups) and / or branched and / or unbranched C | forming _25- alkyl-substituted cycloalkyl group having 3 to 7 ring atoms, wherein the number n is at least 40 wt .-% of the oligomers or used and / or polymers and / or co-oligomers and / or copolymers is at least 4, and wherein R 'and R "of the individual α-hydroxycarboxylic acid within a co-oligomer or co-polymer to R' or R" of one or more α-th Hydroxycarbonsäureeinhei¬ thereof co-oligomer or co-polymer identical or different may be, in cosmetic or dermatological preparations against depolymerization or Deoligomerisation by hydrolysis, characterized in that the Oligo¬ used mers and / or polymers and / or co-oligomers and / or copolymers are incorporated in an oil phase. The erfindungsgmäßen the oligomers and / or polymers and / or co-oligomers and / or co-polymers underlying α-hydroxycarboxylic acids are advantageously ge selected from the group of α-hydroxyalkanoic acids, which in turn particularly vor¬ part way from the group of C2 _-alkyl carboxylic acids be selected. It is particularly preferred to choose the oligomers and / or polymers and / or co-oligomers and / or copolymers of glycolic acid, lactic acid, the α-hydroxybutyric acid and / or α-hybrid droxyvaleriansäure. the sum of the numbers k and j corresponds to the number n. It is to the skilled man it clear that the arrangement of the co-monomers block, in a co-oligomer or co-polymer, alternating, random distribution or can be prepared by different arrangement principles. All these types of arrangements are advantageous according to use. According to the invention is advantageous for those present as enantiomers α-acids Hydroxycar¬ to select as basic components of the oligo- or polymers that are more conducive to the skin care as their optical antipodes, ie for example the L-lactic acid. Advantageously, the number n is for at least 40 wt .-% of the one or Oligo¬ used mers and / or polymers and / or co-oligomers and / or copolymers of at least 8, preferably 10. The upper limit for n can be left open in principle, but have values ​​of n from 60 to 1000, in particular proved to be advantageous 200th However, even polymers that are at least 40 wt .-% of monomer units and about 60,000 such that at least 40 wt .-% of about 100,000 monomer units, may advantageously be used. Oligo (DL-lactate-co-glycolate) (50:50), Average value of n * 8; j * k ■ ■ Advantageously, the content of the inventive Oiigomeren, co-oligomers, polymers and / or co-polymers in the cosmetic or pharmaceutical compositions is 0.01 - 20 wt .-%, preferably 0.5 - 5 wt %, particularly preferably 1.5 - 2.5 wt .-%, each based on the total weight of the cosmetic or pharmaceutical preparations. According to the invention it is preferred that the oligomers or incorporate, co-oligomers, polymers and / or co-polymers in dissolved form in cosmetic formulations. For this purpose, the expert can take from a variety of known and also for the given class of substances generally known solvent a non-inventive selection. However, it was surprising that partially or fully esterified polybasic carboxylic acids would be particularly advantageous solvents for the inventive oligomers, co-oligomers, polymers and / or copolymers. wherein A, B, D, E and F represent branched or unbranched alkyl groups having up to five carbon atoms. CH -COO- Et I HO- C- COO- I Et Et CH 2 -COO- and the diethyl phthalate. It has been found werterhin, surprisingly, that these esters are not only good solvents for the inventive oligomers, polymers, co-oligomers, and / or co-polymers but additionally stabilize against depolymerization or Deoligomerisation. Furthermore, do these esters, preferred is the citric acid, with respect to the kos¬ metic or dermatological action of α-hydroxycarboxylic acids, in particular with respect to, the beneficial effects, especially with regard to the effect against skin aging, synergistically with the inventive oligomers, polymers Co-oligomers and / or copolymers together. Although, for example, from DE-GBM 88 04 423, discloses the use of appropriate Citronensäu¬ esters as plasticizers for Polyiactide / glycolide and similar polymers. The cosmetic or pharmaceutical use according to the invention has neither been suggested by DE-GBM 88 04 423, which relates to surgical materials, nor vorweggenom¬ men. It is also recommended, especially in German Utility Model 88 04 423 as solvents acetone which is pharmaceutically neither cosmetically acceptable. 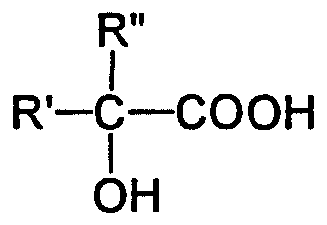 It is also advantageous to use silicone oils such as dimethicone as solvents for the erfindungsgemä¬ SEN oligomers, polymers, co-oligomers and / or co-polymers. The inventive oligomers, polymers, co-oligomers or co-polymers are remarkably stable in cosmetic and pharmaceutical preparations and decompose largely only on human skin to the underlying oligomers which are available for the skin with all its beneficial properties then. It is also possible and may be advantageous to use suspensions of the inventive oligomers, polymers, co-oligomers, and / or co-polymers. Before the solution or suspension operation, it may be advantageous to connect a Micronisation process, wherein it is preferred that micronization under cooling, spielsweise at temperatures less than -78 ° C, especially at temperatures less than -150 ° C, preferably at about -190 ° C to perform. The dissolution process is preferably by means of strong agitation, for example in a turrax Ultra- to make. It may also be advantageous when solvent or Suspensionsvor¬ gang a wetting agent or antistatic agent ain admit. The production of inventive preparations is done according to the conventional manne the Fach¬ common rules. Advantageously, the preparations according to the invention are in the form of emulsions, preferably in front of O / W emulsions. but it is also possible and according to the invention may be advantageous to choose other types of formulation, for example, W / O emulsions, Hydro dispersions, gels, oils, multiple emulsions, spielsweise in the form of W / O / W or OW / O emulsions, anhydrous ointments or Salben¬ bases, etc. In simple emulsions, surrounded by an emulsifier droplets of the second phase lie in a phase finely dispersed, (water droplets in W / O or lipid vesicles in O / W emulsions). In contrast, a multiple emulsion (second degree) of the first phase are emulsified in such droplets finely dispersed droplets. Even in these droplets may in turn still finely dispersed droplets be continued (third degree multiple emulsion) and so on. So how / W emulsions speaks (water-in-oil or oil-in-water) with the simple emulsions of W / O or O, there are at multiple emulsions W / O / W, O / W / O -, O / W / O / W, W / O / V / O-emulsions and so forth. Multiple emulsions in which the respective internal and external water phases or the inner and outer oil phases are different in nature (eg W / O / W and O / W / O 'emulsions), prepared by two-pot processes are accessible. Such emulsions in which the inner and outer water or oil phases are not different in nature, can be obtained both by one and by two-pot procedure. The multiple emulsions of the second degree are sometimes referred to as "bimultiple Systems", third degree such as "trimultiple systems", etc., denotes (W.Seifriz, Studies in Emulsions, J.Phys.Chem, 29 (1925) 738 -. 749). A process for the preparation of multiple emulsions are known to the expert per se. Thus, there are two-pot process in which a simple emulsion submitted (for example, a W / O emulsion), and adding a further phase (for example, a water phase) with an appropriate emulsifying agent (eg, an O / W-emulsifier) ​​(in a multiple emulsion, for example, a W / O / W emulsion) is transferred. A second method is to convert emulsifier with an oil phase and a water phase in a one-pot process in a multiple W / O / W emulsion. The emulsifiers are dissolved in the oil phase and combined with the water phase. A prerequisite for such a method that the HLB values ​​(HLB = Hydrophilic-lipophilic balance) of the individual emulsifiers used are significantly different from each other. Hydro are dispersions of a liquid, semi-solid or solid internal (discontinuous) lipid phase in an external aqueous (continuous) phase. In contrast to O / W emulsions, the aus¬ are characterized by a similar phase arrangement, hydrodispersions but are free of emulsifiers substantially. Hydro¬ dispersions provide, as indeed emulsions are metastable systems and are inclined to two in a state überzu¬ go into coherent discrete phases. In emulsions, the choice of a suitable emulsifier prevents phase separation. Hydro of a liquid lipid phase in an external aqueous phase, the stability of such a system can be ensured by, for example, that a gel structure in the aqueous phase, in which the lipid droplets are stably suspended. Such preparations have proved to be extremely beneficial and extremely stable. Advantageous thickeners for these purposes are Carbopol, thickeners based on polysaccharides and bentonite. Particularly advantageous preparations are also obtained when combining the active compounds with antioxidant and / or other cellular aging counteracting Sub¬ punch. According to the invention, the preparations advantageously comprise one or more antioxidants. Favorable, but nevertheless optional Anti¬ all customary or suitable for cosmetic and / or dermatological applications antioxidants oxidants are used. Amino acids (for example glycine, histidine, tyrosine, tryptophan) and derivatives thereof, imidazoles (for example urocanic acid) and derivatives thereof, peptides such as D, L-carnosine, D-carnosine, L-carnosine and derivatives thereof (for example anserine), carotenoids, carotenes (for example α-carotene, beta-carotene, lycopene) and derivatives thereof, lipoic acid and derivatives thereof (for example dihydrolipoic acid), aurothioglucose, propylthiouracil and other thiols (for example thioredoxin, glutathione, cysteine, cystine, cystamine and their glycosyl, N-acetyl -, methyl, ethyl, propyl, amyl, butyl and lauryl, palmitoyl, oleyl, γ-linoleyl, cholesteryl - and glyceryl esters) and their salts, dilauryl thiodipropionate, distearyl thiodipropionate, thiodipropionic acid and derivatives thereof (esters, ethers, peptides, lipids, nucleotides, nucleosides and salts) as well as Sulfoximin- compounds (eg Buthioninsulfoximine, homocysteine ​​sulfoximine, Buthioninsulfone, penta-, hexa-, Heptahioninsulfoximin) (in very low tolerated doses, for example pmol to .mu.mol / kg), further (metal) -Chela factors (for example α-hydroxy fatty acids, palmitic acid, phytic acid, lactoferrin), humic acid, bile acid, bile extracts, bilirubin, biliverdin, EDTA, EGTA and derivatives thereof, unsaturated fatty acids and their derivatives (eg, γ-linolenic acid, linoleic acid, oleic acid), folic acid and its derivatives, ubiquinone and ubiquinol derivatives thereof, vitamin C and derivatives thereof (eg Ascorbylpalmitate, Mg - ascorbyl phosphates, ascorbyl acetate), tocopherols and derivatives (for example vitamin e - acetate), vitamin A and derivatives (Vita¬ min A - palmitate), and Konyferylbenzoat benzoate of benzoin, rutinic acid and their Deriva¬ te, ferulic acid and derivatives thereof, butylhydroxytoluene, butylhydroxyanisole, Furalglucttol, Nordihydroguajakharzsäure, nordihydroguaiaretic acid, trihydroxybutyrophenone, uric acid and derivatives thereof, mannose and derivatives thereof, zinc and derivatives thereof (for example ZnO, ZnSθ) and selenium derivatives thereof (for example selenomethionine), stilbenes and derivatives thereof erfind (for example stilbene oxide, trans-stilbene oxide) and the this said active ingredients ungsgemäß suitable derivatives (salts, esters, ethers, sugars, nucleotides, nucleosides, peptides and lipids). Particularly advantageous for the purposes of the present invention, oil-soluble antioxidants can be used. The amount of antioxidants (one or more compounds) in the preparations carrying be¬ preferably 0.001 to 30 wt .-%, particularly preferably 0.05 to 20 wt .-%, insbeson particular 1 - 10 wt .-%, based on the total weight of the preparation. If vitamin E and / or derivatives thereof are the antioxidant or antioxidants, is vor¬ part by way of their respective concentrations from the range of 0.001 - 10 wt .-% to choose, based on the total weight of the formulation. If vitamin A or vitamin A derivatives, or carotenes or their derivatives are the antioxidant or antioxidants, is advantageous to choose their respective concentrations from the range from 0.001 to 10 wt .-%, based on the total weight of the formulation, to choose. As wertere cell aging counteracting substances can advantageously re Cttronensäu-, salicylic acid, other beta-hydroxy carboxylic acids, biotin and the like. The cosmetic preparations according to the invention can keep ent cosmetic auxiliaries as are customarily used in such preparations, eg Konservie¬ insurance, bactericides, deodorizing substances, irritation-reducing substances, anti Transpirantien, insect repellents, vitamins, agents for preventing foaming, Farb¬ agents, pigments with a coloring action, thickeners, emollients, moisturizing and / or humectant substances, fats, oils, waxes or other customary constituents of a cosmetic formulation, such as alcohols, polyols, polymers, foam stabilizers, electrolytes, organic solvents or silicone derivatives. Advantageously, the preparations of the invention may also comprise substances which absorb UV radiation in the UVB range, the total amount of the filter substances, for example, 0.1 wt .-% to 30 wt .-%, preferably 0.5 to 10 parts by weight %, in particular from 1 to 6 wt .-%, based on the total weight of the formulation, to provide cosmetic preparations which protect the skin from the entire range of ultraviolet radiation, and in which the Stinging of α-hydroxycarboxylic acids and is α-ketocarboxylic acids prevents or drastically reduced. The pH of the preparations of the invention can advantageously be provided in the acid range ein¬, wherein the pH range of 3.5 - 7 is preferred, particularly preferably 4 - 6, most preferably about 5.5. Ersatunlicherweise undergoes the stability of the inventive oligomers, polymers, co-oligomers, and / or co-polymers by Puf¬ ferung an additional increase. Preparations according to the invention can also advantageously serve as a sunscreen. Emulsions according to the invention, for example in the form of a sun protection cream or a Son¬ are nenschutzmilch advantageous and comprise, for example, the said fats, oils, waxes and other fatty substances, and water, and as is commonly used for such type of formulation an emulsifier. Silicone oils such as dimethylpolysiloxanes, diethylpolysiloxanes, diphenylpolysiloxanes and mixed forms thereof. Alcohols, diols or, preferably ethyl polyols of low C number, and their ethers, ethanol, isopropanol, propylene glycol, glycerol, ethylene glycol, ethylene glycol or monobutyl ether, propylene glycol monomethyl, monoethyl or -monobu- tylether, diethylene glycol monomethyl or monoethyl ether and analogous products, furthermore alcohols having a low carbon number, for example ethanol, isopropanol, 1, 2-propanediol, glycerol, and especially one or more thickeners, one or more thickeners which can be chosen vor¬ geous lysaccharide from silicon dioxide, aluminum silicates, PO or their derivatives such as hyaluronic acid, xanthan gum, hydroxypropyl pylmethylcellulose, particularly advantageously from the group of polyacrylates, preferably a polyacrylate from the group of Carbopols, such as Car¬ bopole grades 980, 981, 1382, 2984, 5984, each individually or in Combination. The cosmetic or dermatological light protection preparations advantageously an¬ organic pigments, in particular micro-pigments, for example in amounts of 0.1 wt .-% to 30 wt .-%, preferably in amounts of 0.5 wt .-% to 10 wt .-% but in particular 1 wt .-% to 6 wt .-%, based on the total weight of the preparations. It is according to the invention advantageous to use in addition to the combinations of this invention oil-soluble UVA filter and / or UVB filters in the lipid phase and / or water-soluble UV-A filter and / or UVB filters in the aqueous phase. The light protection formulations of the invention may contain substances which absorb UV radiation in the UVB range, the total amount of filter substances, for example, 0.1 wt .-% to 30 wt .-%, preferably 0.5 to 10 wt .-%, in particular ¬ sondere 1 to 6 wt .-%, based on the total weight of the preparations, to provide cosmetic preparations which protect the skin from the entire range of ultraviolet radiation. They can also serve as sunscreens. - 2,4,6-trianilino- (p-carbo-2'-ethyl-1'-hexyloxy) -1, 3,5-triazine. - sulfonic acid derivatives of 3-benzylidenecamphor, eg 4- (2-oxo-3-bornylidenemethyl) - benzenesulfonic acid, 2-methyl-5- (2-oxo-3-bornylidenemethyl) sulfonic acid and salts thereof. The list of UVB filters mentioned, the compound combinations in combination with the novel active ingredients can be used of course intended to be limiting. It may also be advantageous to combine the combinations according to the invention with UVA filters which have usually been contained in cosmetic preparations. 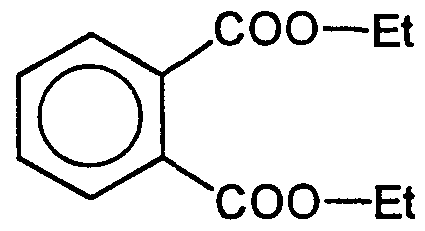 These substances are preferably derivatives of dibenzoylmethane, in particular ins¬ 1- (4'-tert-butylphenyl) -3- (4'-methoxyphenyl) propane-1,3-dione, and by 1-Phe nyI- 3- (4'-isopropylphenyl) propane-1,3-dione. These combinations and preparations which contain these combinations are also subject matter of the invention. It can be used, the amounts used for the UVB combination. Furthermore, it is advantageous to combine the active compound combinations according to the invention with werteren UVA and / or UVB filters. The total amount of UVA filter substances can advantageously wt .-% to 30 wt .-%, preferably 0.5 to 10 wt .-%, particularly 1 to 6 wt .-% is 0.1, based on the total weight of the preparation, is in order to provide cosmetic preparations which protect the skin from the entire range of ultraviolet radiation, and in which prevents the Stinging of α-hydroxycarboxylic acids or α-ketocarboxylic acids or dra¬ cally reduced. even those cosmetic and dermatological preparations which are in the form of a sunscreen, a pre-sun or after-sun product are also advantageous. Advantageously, these additionally contain at least one UVA filter and / or at least one UVB filter. Filtering one or more antioxidants. A precondition for the usability of inorganic pigments for the purposes of this invention is the cosmetic or dermatological acceptability of zugrun¬ deliegenden substances. It is advantageous to select the particle diameter of the pigments used is less than 100 nm. According to the invention, the inorganic pigments are present in hydrophobic form, which means that they are surface-treated. This surface treatment may consist in providing the pigments by processes known per se with a thin hydrophobic layer. is produced, n and m are arbitrary stoichiometric parameters R and R 'are the desired organic radicals. For example, in analogy to DE-OS 33 14 742, hydrophobized pigments are advantageous. Advantageous TiO 2 pigments are, for example, under the trade designations T 805 (Degussa) and M 262 (Kemira) or M 160 (Kemira), or MT 100 T (TAYCA) erhält¬ Lich. Advantageous SiO 2 pigments from the series of products marketed under the trade names of AEROSIL (DEGUSSA) hydrophobic pigments, for example AEROSIL R 812 or AEROSIL R 972 is selected. Preparations according to the invention are advantageous in that they contain from 0.1 to 10% by weight, in particular 0.5 to 5.0 wt .-%, ge features of hydrophobic inorganic pigments, in each case based on the total weight of the composition. In the following examples, advantageous embodiments of the present invention are listed. (a5) with one or more carboxyl groups and / or hydroxyl groups and / or ver¬ branched and / or unbranched C | _25-alkyl substituted phenyl, or wherein the α-carbon atom of the α-hydroxycarboxylic acid with R * and R "together form a (a6) unsubstituted cycloalkyl group having 3 to 7 ring atoms or a (a7) with one or more carboxyl groups and / or hydroxyl groups and / or Oxo¬ groups (keto groups) and / or branched and / or unbranched alkyl groups C1.25- substituted cycloalkyl group formed of 3 to 7 ring atoms, wherein the number n is at least 40 wt .-% of the oligomers or used and / or polymers and / or co-oligomers and / or copolymers is at least 4, and wherein R 'and R "of the individual α-hydroxycarboxylic acid within a co-olive Gomer or co-polymer to R' or R" of one or more α-th Hydroxycarbonsäureeinhei¬ thereof co-oligomer or co-polymer may also be identical or different. (a5) with one or more carboxyl groups and / or hydroxyl groups and / or ver¬ branched and / or unbranched C | _25-alkyl substituted phenyl, or wherein the α-carbon atom of the α-hydroxycarboxylic acid having R 'and R "together form a (a6) unsubstituted cycloalkyl group having 3 to 7 ring atoms or a (a7) with one or more carboxyl groups and / or hydroxyl groups and / or Oxo¬ groups (keto groups) and / or branched and / or unbranched C | _25- alkyl-substituted cycloalkyl group having 3 to 7 ring atoms forming, with the number n is at least 40 wt .-% of the oligomers or used and / or polymers and / or co-oligomers and / or copolymers is at least 4, and wherein R 'and R "of the individual α-hydroxycarboxylic acid within a co-olive Gomer or co-polymer to R' or R" or a a plurality of α-th Hydroxycarbonsäureeinhei¬ thereof co-oligomer or co-polymer may be identical or may also be different, for administration of the underlying monomeric α-hydroxycarboxylic acids in kosmeti¬ rule or dermatological preparations. 3. Preparations according to claim 1 or use according to claim 2, characterized gekenn¬ characterized in that the oligomers, polymers, co-oligomers, and / or co-polymers underlying α-hydroxycarboxylic acids are selected from the group of α- hydroxyalkanoic acids. 4. Preparations according to claim 1 or use according to claim 2, characterized denotes ge that the oligomers, polymers, co-oligomers, and / or co-polymers underlying α-hydroxycarboxylic acids are selected from the group of glycolic acid, lactic acid, α-hydroxybutyric acid and α-hydroxyvaleric acid. 5. Preparations according to claim 1 or use according to claim 2, characterized ge denotes that the number n is at least 40 wt .-% of the one or Oligo¬ used mers and / or polymers and / or co-oligomers and / or Co polymers of at least 8, preferably is 10 degrees. 6. preparations or use according to claim 5, characterized in that n is at most 100,000. 8. preparation or use according to claim 7, characterized in that the triethyl citrate is chosen as the substance of the general structural formula aooc-X-COOB. (A7) with one or more carboxyl groups and / or hydroxyl groups and / or Oxo¬ groups (keto groups) and / or branched and / or unbranched forms Cj.25- alkyl substituted cycloalkyl group having 3 to 7 ring atoms, wherein the number n is at least 40 wt .-% of the oligomers or used and / or polymers and / or co-oligomers co-polymers is and / or at least 4, and wherein R 'and R "of the individual α-hydroxycarboxylic acid within a co-olive Gomer or Co-polymer to R 'or R "of one or more α-th Hydroxycarbonsäureeinhei¬ thereof co-oligomer or co-polymer may be identical or different, in cosmetic or dermatological preparations against depolymerization or Deoligomerisation by hydrolysis, characterized in that that the Oligo¬ used mers and / or polymers and / or co-oligomers co-polymers are incorporated into an oil phase and / or.